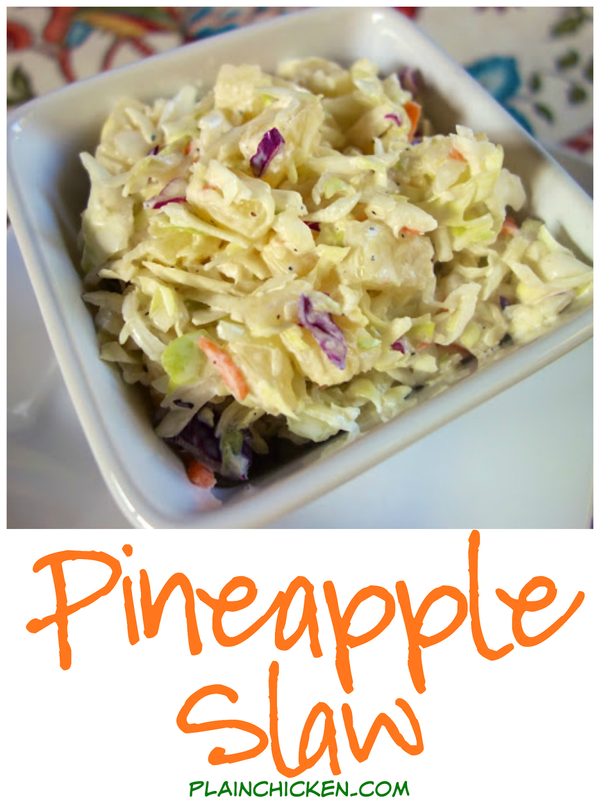 Pineapple Slaw Recipe - cabbage, pineapple, vinegar, sugar and mayonnaise. So simple and tastes amazing! Inspired by our trip to the beach. Pompano Joe's copycat recipe. Great for a potluck. 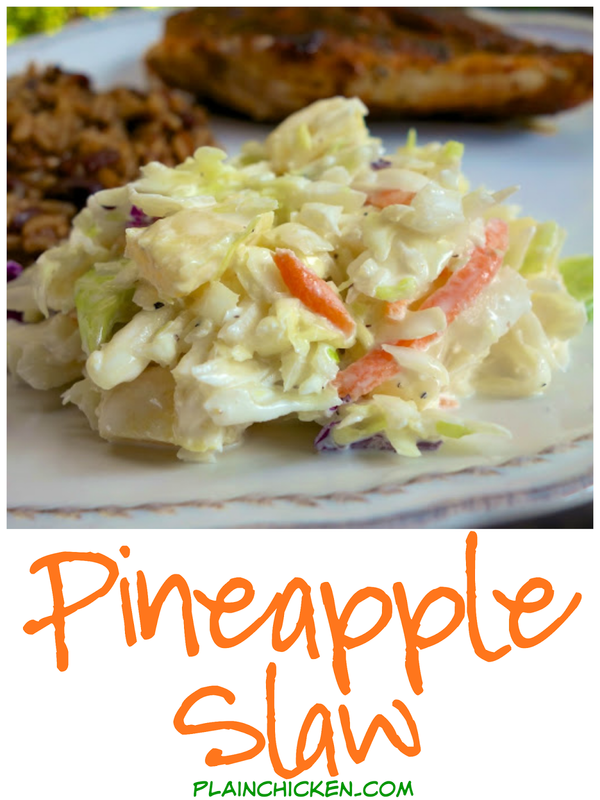 This Pineapple Slaw was also inspired by our meal at Pompano Joe's in Destin. Both of our entrees were served with this slaw. I am not a slaw person, but Chicken Legs took one bite and loved it. He had no idea pineapple would be good in slaw. I promised to recreate it for him at home. I bought a bag of pre-shredded slaw mix at the grocery store. I didn't want to take the time to chop it all at home. This only took a minute to whip together. The slaw was so delicious. It was even better the next day. Next time I will make it the day before I serve it. This would be great for your next cookout, Labor Day next month and tailgating. In a large bowl, whisk together vinegar, sugar, mayonnaise and pepper. Add pineapple and slaw mix. Toss to combine. Chill. I'm loving slaws lately...I just made an Asian one a few weeks ago. Love the addition of the pineapple! I used to make this 30 years ago. I got the recipe from my friend when she served it for her daughter's first birthday dinner. The daughter turns 31 years in November! 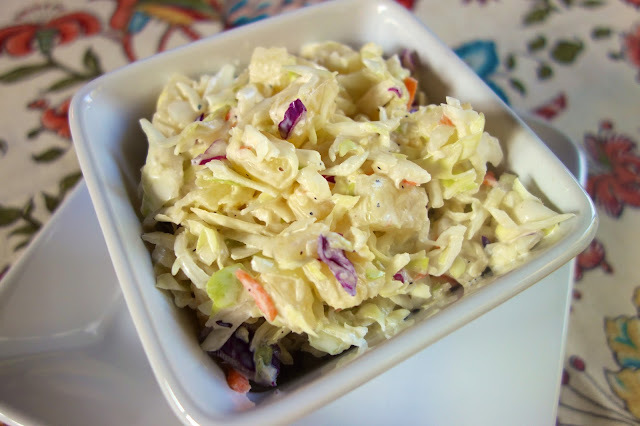 Great coleslaw recipe. Thanks for reminding me about the recipe. I used bag slaw, Marie's Slaw Dressing, chucks of fresh pineapple and blueberries. Just made this last weekend for a potluck and everyone loved it! 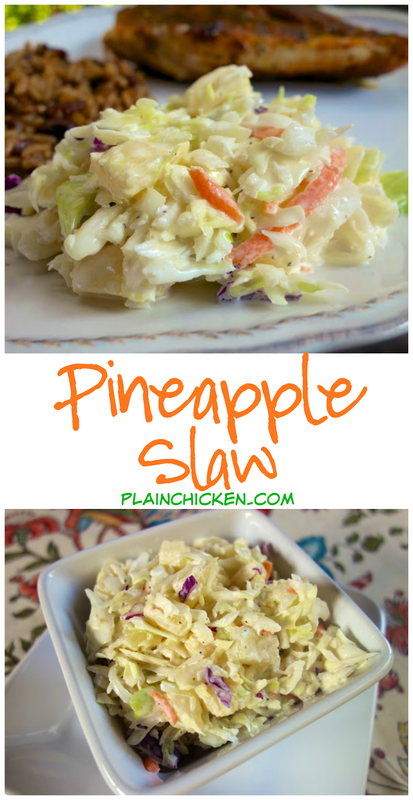 I wouldn't have thought that pineapple would be good in slaw either, but I may have to give this a try! I've been adding pineapple to my slaw for years now, it's so good in it and a suprise too! My mom use to add banana slices too when we were kids. I have been making coleslaw with pineapple for years. I use a little bit of the strained pineapple juice to dilute the mayo so it isn't quite so thick and I also add raisins and chopped walnuts. Yum! 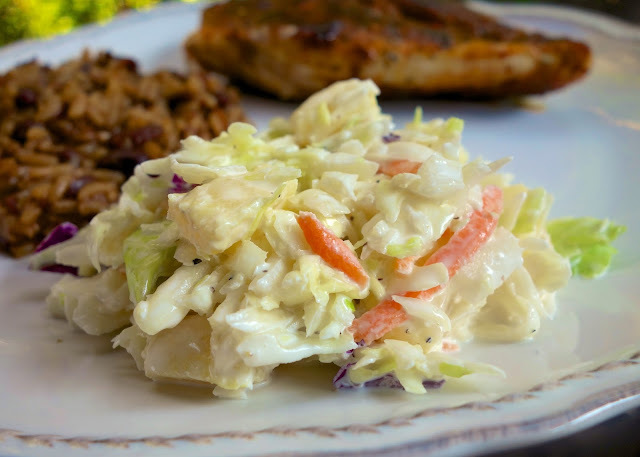 This coleslaw is refreshing due to the addition of pineapple, it goes well with fried foods and barbecues. Thanks and God bless. I see you have several different slaw recipes. Is this the one you add to your Kalua Pork Sandwhiches? I see you have several different recipes for slaw. Is this the one you use for your Kalua Pork sandwhiches? If not which one do you use for those? This one would be delicious with the Kalua Pork sandwiches! Enjoy!